The official blog of the Sinclair St Clair DNA study. You can learn more at http://www.StClairResearch.com. Keep up with our latest discoveries here. Today, I received an email from a young researcher in our family. She had found us via the Sinclair DNA website. Her note included some well-thought-out questions and points. I realized the answer I sent her may be of value for others, so I'm answering her here. Thanks for your note. That's very funny that your dad's name is the same as mine. I've found a few others out there as well. First, the "mythical" history of the St. Clair family from the books Dan Brown likely used to research us. By the way, I used the spelling St. Clair when talking about the wider family because that was the spelling found in the oldest known surviving documents. That or "Saint Clair." The books I mention above are fun to read. You can find them and many others at the Sources page on our Sinclair DNA website. A group is currently putting together what I’m sure will become the definitive books on the real history of the Saint Clairs in Normandy, England, and Scotland. If you watch our websites, you’ll learn more when it comes out. We St. Clairs, Sincelers, Sinclairs (etc.) are all descended from the Viking Rollo (Rhalf Granger), who invaded Normandy in 911. He was from Norway, so that makes us of Viking descent. We are supposed cousins of William the Conqueror, relating to his ancestor Richard I of France. We had at least 1 ancestor who crossed the English Channel in 1066 as a knight with William the Conqueror to defeat the English army at the Battle of Hastings. We supposedly have an ancestor, William 'The Seemly' Sinclair, who went to Scotland instead and later fought against William the Conqueror. Our ancestors in both England and Scotland did well with the various kings and acquired lands and titles. In 1307, when King Philip 'the Fair' decided to take the land of the Knights Templar and rounded them up to burn them, some got word early and fled to Scotland, to Rosslyn in particular. The Sinclair family were closely involved in the order of the Knights Templar. These Templars supposedly had a great treasure which may have included either the Holy Grail or, according to Dan Brown, documents which can prove a supposed bloodline of a union of Jesus Christ and Mary Magdeline. The movie seems to indicate that they may have moved the body of Mary itself. Others think they moved the actual head of Jesus. All this was supposedly buried beneath Rosslyn Chapel, 7 miles south of Edinburgh, Scotland. William St. Clair, who directed the building of Rosslyn Chapel near his castle in 1446, built secret symbols into it as clues about the treasure. William's grandfather, Prince Henry Sinclair of northern Scotland, supposedly travelled with some of the treasure years earlier (1398) to keep it from the Catholic Inquisition. How the timing on this works out and why there was something left behind to be buried at Rosslyn 48 years later has never been adequately explained to me. There are 12 distinct branches of our family (so far), and likely will be more when we get additional participation from England and France (which we hope to do over the next 2 years). Hundreds of families think they descend from Rollo, William the Conqueror and that bunch. People with completely different DNA haplogroups who don’t share a common ancestor for 35,000 years still think they share an ancestor who lived in 911 AD. At least 3 or 4 of our branches were likely in Normandy during the time frame to make parts of the "mythical" story true. We know this based on their DNA SNPs (Single Nucleotide Polymorphisms). Those can be traced and pinned loosely to a general geographic location during a general time frame. The other cool thing about SNPs is that other families who have matching ones can help us determine our history. If we have a Sinclair participant who matches, for instance, the Kincaid surname in a SNP study, then we can get an idea of when they match and the rough geography where they might share a common ancestor. This is important because, imagine we match a surname who had close ties with Rollo. Then we might be able to make some reasonable guesses. The problem is no one knows for sure where Rollo came from. There are arguments that he’s from Scandinavia, and others that he’s from Denmark. One company called Explico claims to be getting permission to DNA test the ancient bones of Rollo’s grandchildren. Rollo’s bones are missing. That would help. A lot of these stories about being related to Rollo, the Templar Knights, etc. were invented in the 1700s and 1800s by supposed researchers who were selling phony genealogies to rich Scottish earls. Are we descended from Rollo? Hopefully, time will tell. Personally, I very much doubt it. Most researchers would tell you that true Norse DNA is either R1a (M420) or I (M253). But time, further testing, and good research may eventually lead to an answer. Are we related to William the Conqueror. Like the lengthy answer above, time will tell. Right now, no one in our family can honestly make such a claim. While our cherished family stories tell of a William “The Seemly” Sinclair, there is zero documentary evidence that he ever existed. The name was almost certainly invented to bridge a gap in a very sloppy genealogy by the genealogists mentioned above so they could get a quick profit from an unsuspecting Scottish earl. This is true. Our ancestors in England and Scotland did quite well. They became important landowners. They witnessed important charters and documents (see the Declaration of Arbroath). And they would have been privy to conversations with important people of their time. The Sinclair / St. Clair family cannot yet be proven to have had anything whatsoever to do with the Knights Templar. I’ve spent months looking through any available trial records to get to the bottom of this. While I’m certainly not done, so far I don’t see our surname in any records. To join the Templar Order, a man had to give up all his land and worldly possessions. The Saint Clair family being important in England and Scotland, I highly doubt they thought to give all that up. But even without giving up their property, they could have donated lands to the order. Many other families did. After extensively digging, I’ve still found zero evidence our family made any donations whatsoever to the Templars. The Great Treasure of the Templars – There’s actually no proof of a treasure, nor a fleet of Templar ships sneaking it out of Europe to Scotland. Zero actual proof. Is that treasure now buried beneath Rosslyn Chapel? Zero proof. While Rosslyn has unusual symbols for a chapel, they’re probably not pointing to a treasure. For instance, there are many carvings of the “Green Man” in Rosslyn. This is not unique in European churches. See this Wikipedia page for a quick overview. 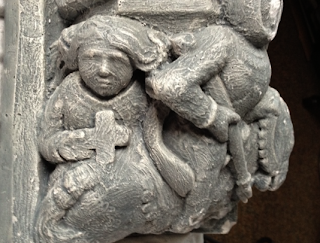 A favorite of grail hunters is the carving of what is supposedly two men riding on a horse in Rosslyn. This is supposed to represent the Templar symbol of being a poor knight and sharing a horse. Only one problem: It’s one man riding a horse and one standing behind the flank of it. You can study a photo I took of it above. This is from a cast made by Rosslyn Chapel. The story of Prince Henry Sinclair had become more an more popular in recent years. Unfortunately, despite some interesting circumstantial evidence, there is zero physical evidence. Thanks for the note. I hope this wasn’t too much reading. Please keep up with the DNA study at our blogs, website and social media. Ah... this is wonderful reading! Great! Martha St.Clair Park. Just did my 23 & Me, but I remember you saying it won't be great help, since I'm a girl. This is cool to know cause I'm a descendent of prince Henry Sinclair. The "Holy Grail" of DNA?